We are one step closer to making it to the world cup. This afternoon we beat Chile 5-0 in our first game of the tournament. It was a pretty good game and a consistent performance from us. No PC’s against and Cronky only got 2 touches. We created plenty of scoring chances so Frank was quite happy. There were about 4,000 people at the game (apparently) but its funny how quiet a stadium can get when we score a goal. I was in the crowd cheering with the other two girls so thats all that matters. The schedule keeps changing by the day but we now have till Thursday until we play our next game against Malaysia. 3 games to go ( and win ) then it will be job done. We are all really enjoying the sites and sounds that Chile has to offer. The view of the Andes mountains out our window is a nice site to wake up to. Can’t complain. 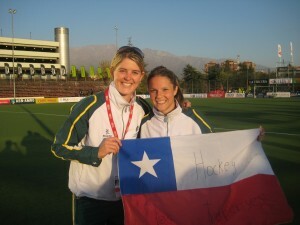 The Hockeyroos have arrived in Chile and last night we played an international test match against Chile which we won 4-0. A match purely for practice in the lead up to our World Cup Qualifier event but nevertheless a great start for us. The field is located at the foot of the andies mountains which is a nice incentive to turn up to training. We have had a bit of a look around chile and experienced some of the culture but the focus is on the tournament and preparing as best as we can in order to get the job done and win. The spanish lessons have been a huge help as Ive been able to mix with the locals and interact in a common language. We hope to start the tournament on Sunday but due to the problems in Europe both Scotland and Ireland still have not arrived. I will keep you all updated. Bye for now. 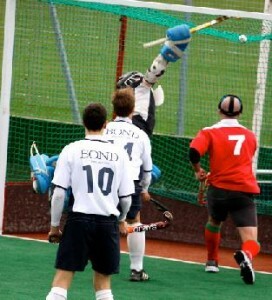 Zinc oxide tape is a great stick grip for goalkeepers. Players spend a great amount of time taping their stick handles to get that extra for drag flicking or strong hits. 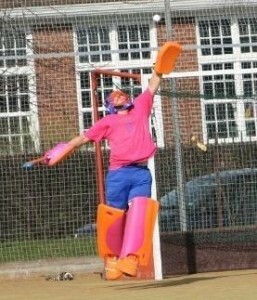 Goalkeepers, as kit addicts, should also spend as much time if not more tweaking their equipment to suit their needs. I got this tip from Sparta hockey (the famous goalkeeping coach duo of Steve and Panda in England) and have find it to be extremely useful ever since. 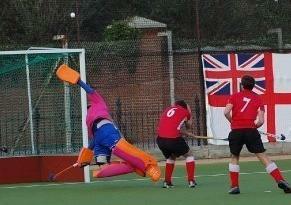 Zinc oxide tape is a great alternative stick grip for goalkeepers. The grip itself is soft and smooth, but at the same time grippy, making it easier to slide your hand up or down the stick to change position of where you are holding it easily. Zinc oxide tape is great for gripping the stick in extension; giving you for when you extend the stick out (lowering your hold in stick tackles or extended stick saves i.e. when diving) and then want to hold it high again. Auction sites like ebay are great places to buy it. Zinc oxide tape is supposed to be used for medical cures to cover blisters, so you should be able to find it in pharmaceutical stores too. The tape itself is self-adhesive, with the underside being the sticking surface. Therefore all you have to do is roll the tape around the stick, with the non-sticky side facing you, to get it to tape to the stick. The technique is to wrap the tape around the stick, so that you get the tape to cover the stick handle; try to work diagonally to cover more area. It is easy just to simply tape over an existing grip (unless you want to remove it! ), as a double tape grip gives you more to hold on to. To finish off, you can wrap some insulation tape around the ends to cover them and prevent any peeling.